Everything you need to know on Android Nougat update for Moto G4 and Moto G4 Plus! In almost all regions, Android Nougat update for Moto G4 (and G4 Plus) has been rolled out. You should check the update now if your Moto G4 is still running Marshmallow. Android Nougat for Moto G4 is a major Android udpate with many new features and improvement you should try. This Moto G guide explains to you the top 10 new features in this Android Nougat update for Moto G4. Please note, although Moto G4 is used in this post, all these new features also apply to all Motorola Moto devices with Android Nougat. Android Nougat supports split screen (multi-window) view. You can run two apps side by side on your screen after applying the Android Nougat update. For example, you can reply to a text message while watching a video, or browse the internet during a video call. You can activate multi-window view by long-pressing the overview/recent apps button while in a compatible app. Please note, whether an app is compatible with multi window view is determined by individual app developer. 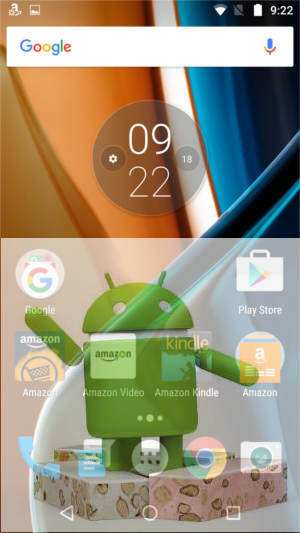 You may check this guide on how to use multi window feature in Android Nougat update for Moto G4. Android Nougat also allows you to quickly switch between two recent apps. You can double tap the overview/recent apps button to switch between two most recently used apps. Quick switch apps works even when you are in Home screen. In Moto G4 Home screen, you can double tap the overview button to open the last used app. Double tap again to switch the second most recent app. Motorola added one more Moto action in Android Nougat update for Moto G4: swipe to shrink the screen. You can shrink the screen by swiping up from the navigation bar in the bottom. If you swipe upwards and towards left, the shrunk screen will align to bottom left. If you swipe upwards and towards right, the shrunk screen will be docked in the bottom right. To enable this new feature, you need to open the Moto app, tap Actions, then tap Swipe to shrink the screen to enable it. You can practice this feature before enabling it. Please refer to this guide (coming soon) on how to use Moto Actions.